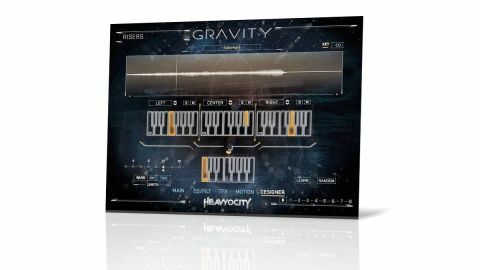 Big, brash and boldly contemporary, Gravity has Heavyocity pushing the envelope of Kontakt scripting and sampling again, and is without doubt one of their best yet. Huge soundbank, with an enormous variety of sonic possibility for cinematic score composers. A 9GB "scoring tools" library (ie, built on 'sound design' type material for cinematic projects), Gravity houses a hugely extensive soundbank and preset/snapshot list in an action-packed (if a tad overdesigned) scripted interface. This includes the usual Heavyocity toys - Twist and Punish, Trigger FX, EQ/Filter section - plus the new Motion step sequencer for modulation of volume, pan and pitch. The library consists of four sections - Hits, Pads, Risers and Stings - each further subdivided into individual instrument folders and Menu patches. With each sound type differing significantly in the engine it uses, the specifics of the interface vary quite a bit, which keeps things interesting but can get a little confusing. Worthy of particular note is the Designer page, in which you can construct layered risers and hits by mixing up Subs, Impacts, Tails and Whooshes.